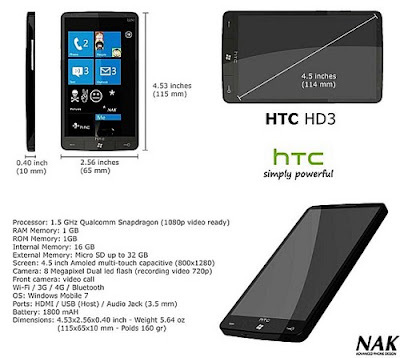 It’s common knowledge that the HTC HD2 is one of the most capable devices currently on the market running Windows Mobile. In fact, it may be the single most capable device ever to run Windows Mobile. Regardless, Microsoft’s latest attempt at a mobile operating system with Windows Phone 7 is quickly approaching with hardware manufacturers everywhere gearing up their own offerings. Seeing how the HTC HD2 was such a successful device, speculation regarding a Windows Phone 7 powered HTC HD3 has become the general consensus. Today, a supposed spec sheet for the HD3 has leaked out giving us a look at what seems to be hardware components that are too good to be true. As you can see from the above pictured spec sheet, the HD3 is said to feature a 4.5-inch screen, a 1.5GHz processor, 1GB of RAM, an 8 megapixel camera and more. While it wouldn’t be too far off to dream of a device with such specs, it also wouldn’t be too hard for someone to do whip up a fake list in Photoshop. We’ll have to wait until someone officially involved with the matter comes forth to speak more. I think htc is the current best. How about blue screen in there? Yeah. 1.5 Ghz is crazy.. if it's true. Its a great blog, Well done and keep informing us.